Mobility is key for seniors aging in place and finding a versatile 4-wheel walker with a seat allows them to continue their active lifestyle. This type of walker is also referred to as a rollator, as it makes it easier to get around despite any mobility issues one might have. We have looked at a variety of 4-wheel walkers with seats to find the best options and here are three of the best rollators. 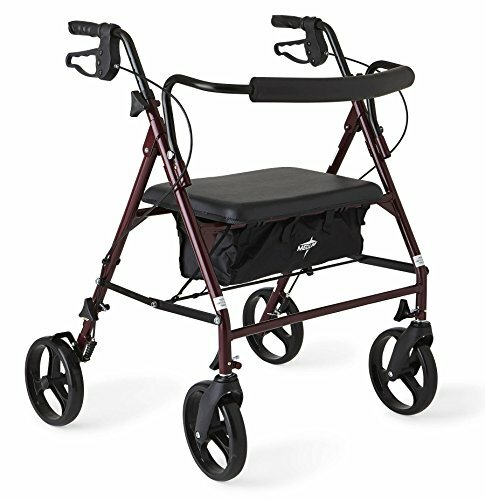 This walker accommodates up to 500 pounds, is wide and features a pocket below the seat. The Medline Heavy-Duty Bariatric Mobility Rollator is an ideal choice for bariatric seniors. Plus it’s a portable option that quickly folds up for transport for ensured mobility on-the-go. The steel frame resists cracking even with heavier weights and the handle height is adjustable so that seniors of varying heights can find the right measurements for them. The extended width between the handles allows bariatric seniors to slide between them for greater stability when they are walking. The padded backrest and seat provide comfort when you are sitting. The loop brakes stop easily. The walker maneuvers easily, but due to its width, the rollator may not fit through all door frames. The height is adjustable on this one, features a basket and has large wheels. The ProBasics Transport Rollator Walker features standard handgrips that are easy to hold onto, even for seniors with arthritis. When using this as a wheelchair, there is a push bar for caregivers, not to mention footrests that fold over for the patient. Seniors can adjust the height to ensure the perfect level of stability. The hand brakes lock so that the rollator does not slide away when using the seat. There is a basket underneath the seat, a great feature when seniors want to do a little shopping. The back support provides extra comfort when seniors are sitting in the padded seat. The frame is aluminum. The frame will not rust even when you use this rollator in moist or humid environments often. We like that while lightweight, it accommodates up to 300 pounds, and assembles without tools. 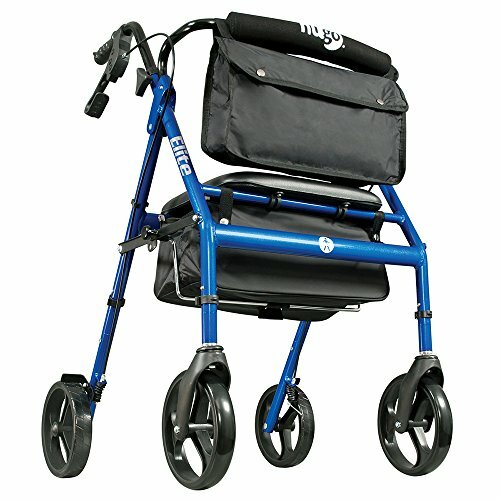 The Hugo Elite Rollator Walker is a lightweight and foldable 4-wheel walker. It is ideal for easy movement around the house, and for traveling since it is portable. 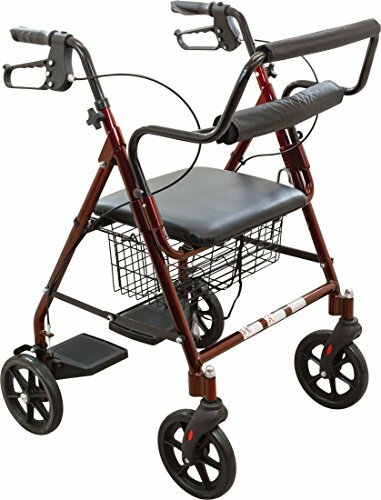 The large wheels offer greater stability for seniors on all surface types. And is ideal for bumpy pavement and even grass because the large wheels push easily over rough and soft surfaces. It includes a saddle bag for wallet, keys, phone, and other items needed on-the-go. Putting the walker together requires no tools. Seniors with moderate hand dexterity can tackle assembly themselves. However, those with significant arthritis in their hands may need assistance. The brakes are on the handles. They are relatively easy to engage and disengage. The backrest provides extra comfort when seniors sit on the padded seat. Before buying a 4-wheel walker with a seat, it is important to get the facts. Learn about the features, the types of rollators, and other important details to ensure that you make the right choice. Rollators with four wheels typically come in two options. These include a standard rollator and a bariatric rollator. Both rollator types have the same design with four wheels. There are two wheels in the back and two in the front. Both provide support and a place to rest for seniors when they are on-the-go. The primary difference is that the bariatric options can accommodate seniors up to 500 pounds. The standard walkers typically support up to 300 pounds. Most rollators allow you to adjust the different components to your height. It is important that the adjustments are proper to provide the most stability and safety for seniors using the device. The seat to floor height makes it safe and easy to sit in the chair component. Measure this by measuring from your knees to the floor. This is the height the seat should be at. The next essential measurement is the handle height. Measure from your wrist to the floor. To perform this measurement, stand up straight, wear flat shoes and bend your elbows slightly so that the back of your wrist is facing the floor. Use this measurement to determine the proper handle height. At the right height, seniors can grip the rollator handles best. There are numerous specifications that you need to consider when looking for the right 3-wheel seated walker. The proper specifications ensure that the rollator can support you and help you to be safely mobile. There are two primary seat choices with this type of walker. These include unpadded and padded seats. Padded seats are a good choice for seniors with hip arthritis or those who are frail. These offer greater comfort in these situations. Unpadded seats may be easier to clean. These are ideal for seniors who experience incontinence. This type of seat also offers extra stability, so it may be a good option for seniors with unstable balance. When you sit down, you need to engage the brakes so that the walker does not move. Consider the type of brakes that will be the easiest for you to control and ensure that they lock. There are loop brakes that are on the handles of the walker. Most seniors can use these without issue. However, those with severe arthritis might find it difficult to keep the brakes pressed down. The second type is a push-down brake. This type activates due to your weight. A push-down brake is a good option for seniors who have hand dexterity issues or memory impairment. Some walkers already come with some of these features and accessories. If the walker you prefer does not have these, they are relatively easy to add to most 4-wheel walkers. A solid, well-designed walker is worth its weight in gold when it comes to maintaining independence and mobility. As you shop put each walker to the test and consider factors like where it will be used, when, what else it may be needed for, and how it will operate in various weather. Maker sure you look for something that is comfortable, but safe.